"Yellow earth" redirects here. For the film, see Yellow Earth. Loess (US: /lɛs, ˈloʊ.əs, lʌs/, UK: /lɜːs/; from German Löss [lœs]) is a clastic, predominantly silt-sized sediment that is formed by the accumulation of wind-blown dust. Ten percent of the Earth's land area is covered by loess or similar deposits. The word loess, with connotations of origin by wind-deposited accumulation, came into English from German Löss, which can be traced back to Swiss German and is cognate with the English word loose and the German word los. It was first applied to Rhine River valley loess about 1821. Loess deposits may become very thick, more than a hundred meters in areas of China and tens of meters in parts of the Midwestern United States. It generally occurs as a blanket deposit that covers areas of hundreds of square kilometers and tens of meters thick. In several areas of the world, loess ridges have formed that are aligned with the prevailing winds during the last glacial maximum. These are called "paha ridges" in America and "greda ridges" in Europe. The form of these loess dunes has been explained by a combination of wind and tundra conditions. Periglacial (glacial) loess is derived from the floodplains of glacial braided rivers that carried large volumes of glacial meltwater and sediments from the annual melting of continental icesheets and mountain icecaps during the spring and summer. During the autumn and winter, when melting of the icesheets and icecaps ceased, the flow of meltwater down these rivers either ceased or was greatly reduced. As a consequence, large parts of the formerly submerged and unvegetated floodplains of these braided rivers dried out and were exposed to the wind. Because these floodplains consist of sediment containing a high content of glacially ground flour-like silt and clay, they were highly susceptible to winnowing of their silts and clays by the wind. Once entrained by the wind, particles were then deposited downwind. 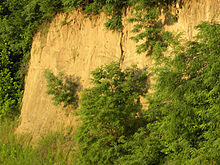 The loess deposits found along both sides of the Mississippi River Alluvial Valley are a classic example of periglacial loess. In England, periglacial loess is also known as brickearth. The thick Chinese loess deposits are non-glacial loess having been blown in from deserts in northern China. The loess covering the Great Plains of Nebraska, Kansas, and Colorado is considered to be non-glacial desert loess. Non-glacial desert loess is also found in Australia and Africa. Soils underlain by loess tend to be excessively drained. The fine grains weather rapidly due to their large surface area, making soils derived from loess rich. One theory states that the fertility of loess soils is due largely to cation exchange capacity (the ability of plants to absorb nutrients from the soil) and porosity (the air-filled space in the soil). The fertility of loess is not due to organic matter content, which tends to be rather low, unlike tropical soils which derive their fertility almost wholly from organic matter. Even well managed loess farmland can experience dramatic erosion of well over 2.5 kg /m2 per year. In China the loess deposits which give the Yellow River its color have been farmed and have produced phenomenal yields for over one thousand years. Winds pick up loess particles, contributing to the Asian Dust pollution problem. The largest deposit of loess in the United States, the Loess Hills along the border of Iowa and Nebraska, has survived intensive farming and poor farming practices. For almost 150 years, this loess deposit was farmed with mouldboard ploughs and fall tilled, both intensely erosive. At times it suffered erosion rates of over 10 kilograms per square meter per year. Today this loess deposit is worked as low till or no till in all areas and is aggressively terraced. Much of Argentina is covered by loess. Two areas of loess are usually distinguished in Argentina: the neotropical loess north of latitude 30° S and the pampean loess. The neotropical loess is made of silt or silty clay. Relative to the pampean loess the neotropical loess is poor in quartz and calcium carbonate. The source region for this loess is thought by some scientists to be areas of fluvio-glacial depostis the Andean foothills formed by the Patagonian Ice Sheet. Other researchers stress the importance of volcanic material in the neotropical loess. The pampean loess is sandy or made of silty sand. From Southern Tajikistan up to Almaty, Kazakhstan, spans an area of multiple loess deposits. Map showing the distribution of loess in United States. ^ a b c d e f g h i j k l m n Frechen, M (2011). "Loess in Europe". Quaternary Science Journal. 60 (1): 3–5. doi:10.3285/eg.60.1.00. ^ Vasiljevic, D. A.; Markovic, S. B.; Hose, T. A.; Smalley, I.; O'Hara-Dhand, K.; Basarin, B.; Lukic, T.; Vujicic, M. D. (2011). "Loess Towards (Geo) Tourism – Proposed Application on Loess in Vojvodina Region (North Serbia)". Acta geographica Slovenica. 51 (2): 390–406. doi:10.3986/AGS51305. ^ "loess". Online Etymology Dictionary. ^ "loess (sedimentary deposit)". Encyclopædia Britannica. Retrieved 2013-12-22. ^ "DWDS | Suchergebnisse". Dwds.de. Retrieved 2013-12-22. ^ Leonhard K. C. von (1823–1824). Charakteristik der Felsarten. 3 Vols., J. Engelmann Verlag Heidelberg, pp. 772. ^ Virlet D'Aoust P.T. (1857). "Observations sur un terrain d`origine météorique ou de transport aerien qui existe au Mexique et sur le phénomène des trombes de poussière auquel il doit principalement son origine". Geol. Soc. France, Full., 2d, Ser. 2, 129–139. ^ Richthofen F. von (1878). "Bemerkungen zur Lößbildung". Verh Geol Reichsanst, Berlin, pp 1–13. ^ Kukla G. (1970). "Correlation between loesses and deep-sea sediments". Geologiske Foreningen Foerhandlingar 92: 148–180. Stockholm. ^ Kukla G. J. (1975). "Loess stratigraphy of Central Europe". In: Butzer K. W. & Isaac G. L. (eds.) After the Australopithecus, pp. 99–188. Mouton, The Hague. ^ Kukla, G. J. (1977). "Pleistocene Land-Sea Correlations I. Europe". Earth-Science Reviews. 13: 307–374. Bibcode:1977ESRv...13..307K. doi:10.1016/0012-8252(77)90125-8. ^ Zöller, L.; Oches, E. A.; McCoy, W. D. (1994). "Towards a revised chronostratigraphy of loess in Austria with respect to key sections in the Czech Republic and in Hungary". Quaternary Geochronology. 13: 465–472. Bibcode:1994QSRv...13..465Z. doi:10.1016/0277-3791(94)90059-0. ^ Frechen, M.; Horváth, E.; Gábris, G. (1997). "Geochronology of Middle and Upper Pleistocene loess sections in Hungary". Quaternary Research. 48: 291–312. Bibcode:1997QuRes..48..291F. doi:10.1006/qres.1997.1929. ^ Murray, A. S.; Wintle, A. G. (2000). "Luminescence dating of quartz using an improved single aliquot regenerative-dose protocol". Radiation Measurements. 32: 57–73. Bibcode:2000RadM...32...57M. doi:10.1016/S1350-4487(99)00253-X. ^ Thiel, C.; Buylaert, J. P.; Murray, A. S.; Terhorst, B.; Tsukamoto, S.; Frechen, M.; Sprafke, T. (2011). "Investigating the chronostratigraphy of prominent palaeosols in Lower Austria using post-IR IRSL dating". Quaternary Science Journal. 60 (1): 137–152. doi:10.3285/eg.60.1.10. ^ Schmidt, E. D.; Semmel, A.; Frechen, M. (2011). "Luminescence dating of the loess/palaeosol sequence at the gravel quarry Gaul/Weilbach, Southern Hesse (Germany)". Quaternary Science Journal. 60 (1): 116–125. doi:10.3285/eg.60.1.08. ^ Frechen, M. (2011). "Loess in Eurasia". Quaternary International. 234 (1–2): 1–3. Bibcode:2011QuInt.234....1F. doi:10.1016/j.quaint.2010.11.014. ^ Pye, K (1995). "The nature, origin and accumulation of loess". Quaternary Science Reviews. 14: 653–667. Bibcode:1995QSRv...14..653P. doi:10.1016/0277-3791(95)00047-x. ^ a b Bettis, E.A. ; Muhs, D.R. ; Roberts, H.M.; Wintle, A.G. (2003). "Last Glacial loess in the conterminous USA". Quaternary Science Reviews. 22 (18–19): 1907–1946. Bibcode:2003QSRv...22.1907A. doi:10.1016/S0277-3791(03)00169-0. ^ a b Muhs, D.R. ; Bettis, III, E.A. (2003). "Quaternary loess-paleosol sequences as examples of climate-driven sedimentary extremes" (PDF). GSA Special Papers. 370: 53–74. doi:10.1130/0-8137-2370-1.53. ^ Iriondo, M.H. ; Krohling, D.M. (2007). "Non-classical types of loess". Sedimentary Geology. 202 (3): 352–368. Bibcode:2007SedG..202..352I. doi:10.1016/j.sedgeo.2007.03.012. ^ Whalley, W.B., Marshall, J.R., Smith, B.J. 1982, Origin of desert loess from some experimental observations, Nature, 300, 433-435. ^ Ding, Z.; Sun, J. (1999). "Changes in Sand Content of Loess Deposits along a North–South Transect of the Chinese Loess Plateau and the Implications for Desert Variations". Quaternary Research. 52: 56–62. Bibcode:1999QuRes..52...56D. doi:10.1006/qres.1999.2045. ^ Haberlah, D (2007). "A call for Australian loess". Area. 39 (2): 224–229. doi:10.1111/j.1475-4762.2007.00730.x. ^ Getis, Arthur; Judith Getis and Jerome D. Fellmann (2000). Introduction to Geography, Seventh Edition. McGraw Hill. p. 99. ISBN 0-697-38506-X. ^ a b c Sagayo, José Manuel (1995). "The Argentine neotropical loess: An overview". Quaternary Science Reviews. Pergamon. 14 (7–8): 755–766. Bibcode:1995QSRv...14..755S. doi:10.1016/0277-3791(95)00050-X. ^ Ding, Z.L. (2002). "The loess record in southern Tajikistan and correlation with Chinese loess". Earth and Planetary Science Letters. Elsevier. 200 (3–4): 387–400. Bibcode:2002E&PSL.200..387D. doi:10.1016/S0012-821X(02)00637-4. , Fig. 1 (b) showing the distribution of loess, deserts, and mountains in Central Asia (adopted from [T.S. Liu, Loess and the Environment, China Ocean Press, Beijing, 1985.]). The locality of the Chashmanigar loess section is indicated by the solid arrow. ^ "Huang He". The Columbia Encyclopedia (6th ed.). 2007. Archived from the original on June 5, 2009. ^ Smalley, I.J., Davin, J.E. 1980. The First Hundred Years-A Historical Bibliography of New Zealand Loess. New Zealand Soil Bureau Bibliographic Report 28, 166pp. ^ *Hardcastle, J. 1890. On the Timaru loess as a climate register. Transcations & Proceedings of the New Zealand Institute 23, 324-332 (on line: Royal Society of New Zealand http://rsnz.natlib.govt.nz; reproduced in Loess Letter supplement 23, November 1988). ^ Muhs; et al. (2013-02-06). "Eolian History of North America: Task 2, Understand the paleoclimatic significance of loess". USGS. Archived from the original on 2013-02-18. ^ Miller, B.J., G.C. Lewis, J.J. Alford, and W.J. Day, 1985, Loesses in Louisiana and at Vicksburg, Mississippi. Guidebook, Friends of the Pleistocene Field Trip, 12-14 April, 1985. LA Agricultural Experimental Station, Louisiana State University, Baton Rouge, Louisiana. 126 pp. Smalley, I. J. (editor) 1975. Loess Lithology & Genesis. Benchmark Geology 26. Dowden, Hutchinson & Ross 454pp. Smalley, I. J. 1980. Loess: A Partial Bibliography. Geobooks/Elsevier. ISBN 0 86094 036 5. 103pp. Rozycki, S. Z. 1991. Loess and Loess-like Deposits. Ossolineum Wroclaw ISBN 83-04-03745-9. 187pp. Look up loess in Wiktionary, the free dictionary. Wikimedia Commons has media related to Loess. Wikisource has the text of the 1920 Encyclopedia Americana article Loess.